Contact lenses can be worn whether you are short-sighted, long-sighted, a multifocal wearer, or wear glasses to correct astigmatism! New lens technology has enhanced the comfort of contact lenses. Materials have been introduced minimising dry eye, whilst insuring eye comfort. Contact lenses should not cause problems if care directions given by our optometrist are correctly followed. Patients must ensure their hygiene regime is closely followed, and that contact lenses are not worn past their replacement date. Wearers who fail to follow the correct care instructions could experience difficulties. 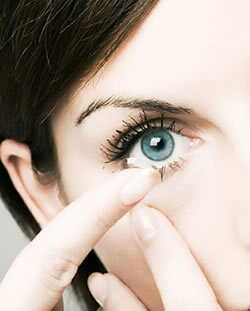 If you are interested in trying contact lenses contact us to make an appointment today.